Jesuscan be your friend and Savior. AllChristian parents want their children to come to a relationship with Jesus. MyFriend Jesus is written in fresh, clear language thatchildren can understand and is appropriate for all denominations. The booknot only tells the gospel story about Jesus, but also, in the mostnatural, gentle way, introduces children to a personal relationship with Him. Aprayer at the end of the book guides children into that life-changingfriendship with Jesus. This is the book author Kathryn Slattery wishes she had when her ownchildren were young-which is the reason she wrote it! Originally published as The Gospel for Kids,this book sold more than 100,000 copies. This new book will feature beautifulnew art and lightly edited text. 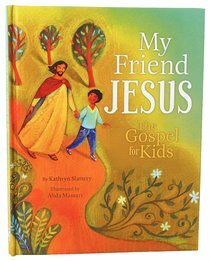 About "My Friend Jesus; the Gospel For Kids"
Kathryn Slattery is the contributing editor of Guideposts and the author of such books as The Gospel for Kids, The Grace to Grow and A Bright Shining Place. Her writing has also appeared in such publications as The Wall Street Journal and Today's Christian Woman. Kathryn resides in New Canaan, Connecticut, with her husband. They are the parents of two adult children.